Poster of “A Corpo Libero” tribute for Goliarda Sapienza in Gaeta, August 30th, 2016. Card with details of the jeans textile bust “Re-vault”, h 75 cm, mixed tecniques, 2014-’16. Clockwise: Siren’s filling – front view with the moon and the constellation of Scorpio (Antares), uterus and anemones – dolphen, moon and starfish in the back. On August 30th 2016, in Gaeta (Latina, Italy), from 19:30, at the Terrazza Borbonica in via Bausan 1 (better known as Punta dello Stendardo) “A Corpo Libero”, a tribute for Goliarda Sapienza will take place. 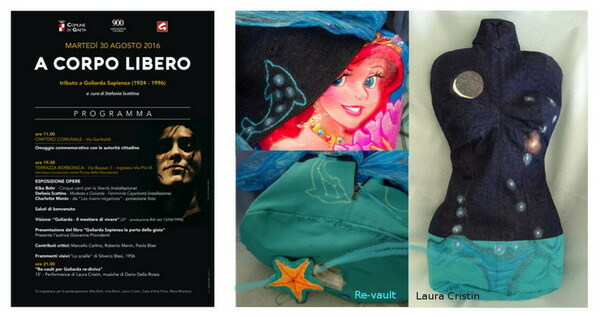 The performance “Re-vault” closes the tribute at 21:00. Immersed in a nocturnal vault approaching the new moon, a performance for Goliarda starts off. It happens from Gaeta sea, inhabited by Sirens, and so beloved by her. « What I have thought for you and I will discover on the shore is not a lifeless bust of Sea and Sky. This textile bust/pillow is meant to attract the traces of your memories, fleeting for the most but well evident to the heart of many. It perfumes of liberty and joy and I have named it “Re-vault”, aka Arcana XVI. Once filled with our affinities, with veils/waves along with consonant tunes, it will become a soft pillow to cuddle the revived memories of you. A sort of calisthenics for the soul will take place on August 30th, 2016, exactly twenty years after your departure from this physical world. Forever in our heARTs ».